High quality soft EVA Foam Mats. Our EVA foam interlocking mats are made from soft, durable EVA non-toxic foam and are soft, safe, waterproof and easy to clean. Ideal floor protection that can be moved around the house to protect as required. 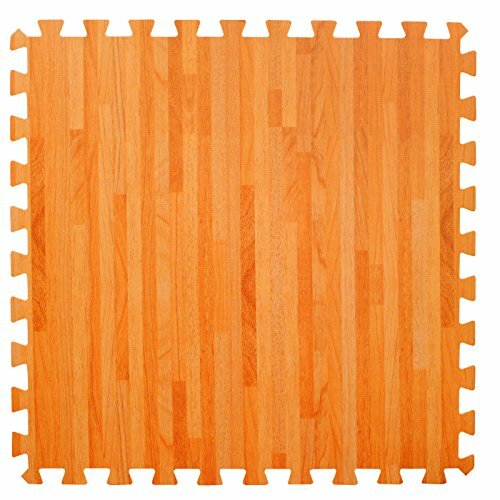 This wooden effect mat pack features 4 large brown interlocking foam mats with wooden pattern. The mats are easy to clean and are waterproof and slip resistant. Product Dimensions: 24 x 24in. Foam Thickness: 0.4in. Surface Area: 48in2 Package Contents 4 large x EVA foam mat pieces. For the Love of Leisure provides a factory warranty on this product and this is only available from For the Love of Leisure Limited, the authorised seller for the product. These interlocking tile pieces with edges provide superb floor protection - great for workouts or providing a padded space for a kitchen, bathroom, bedroom, shower room or to use in the place of carpet, or even wallpaper! Made from high quality, non-toxic EVA soft foam and they are incredibly easy to clean and are water resistant. Act as a great universal protector and defender of your floor surfaces. Perfect for garages, utility rooms, kids bedrooms, nurseries, playgrounds, playrooms or the garden. If you have any questions about this product by For the Love of Home Leisure, contact us by completing and submitting the form below. If you are looking for a specif part number, please include it with your message.